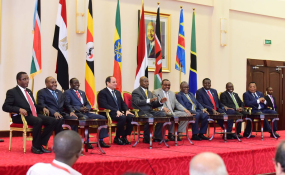 Photographs of dignitaries and presidents taken from last week's Nile Basin Initiative (NBI) heads of state summit at State House, Entebbe suggest the meeting was a tremendous success. But behind-the-scenes accounts of the June 20 to 22 event offer a contrasting narrative. The summit was convened largely to provide an opportunity for all 10 countries using the River Nile waters to agree on how to equitably use the resource. However, the first signs that all was not well emerged when news filtered through that Sudan president Omar al-Bashir and his South Sudan counterpart Salva Kiir would skip the event. Only Egypt's Abdel Fattah el-Sisi and Ethiopia's Hailemariam Desalegn showed up for the June 22 summit, where they spent five hours meeting behind closed doors with their host, President Museveni. State House sources told The Observer that all 10 heads of state that share the River Nile waters were invited and had promised to attend in person. "When they responded positively, we even booked presidential suites in all five-star hotels in Kampala, paid and deployed heavily," said a source. Two days to the summit, the source said, State House got official communication from some embassies, announcing that their presidents would not attend the summit, but would, instead, send representatives. "The first call came from Kenya, followed by Rwanda, Sudan, South Sudan, Burundi and Tanzania," said another source, adding that the embassies did not give clear reasons why their presidents were turning down the invitations at the last minute. The sources added that even some of the presidential representatives who turned up for the summit did not spend a night in their reserved hotel rooms. "Some guests arrived on Wednesday, attended the [ministerial and technocrats'] meeting for only three hours and went back," a security source said, adding that the government incurred losses. Interviewed for a comment on Friday, the Senior Presidential Press Secretary, Don Wanyama, said that all countries invited honoured their invitations and those presidents who did not attend sent representatives. Wanyama added that the government considered the summit a success, despite most presidents not showing up, because no country boycotted the event. "Kenya's president Uhuru Kenyatta could not come because he is busy with campaigns but other presidents sent their deputies," he said. From the start of the summit on June 20, it was clear that agreeing on the equitable use of the River Nile waters by all stakeholders was a long shot because technocrats repeatedly walked out of meetings held at Speke Resort Munyonyo. Despite their first meeting ending at midnight, the technical team met again the next day, June 21, but still failed to agree on anything. Led by Sudan, water security experts walked out of Victoria Ballroom at 10pm on June 21, disappointed. They were followed by their colleagues from Ethiopia and other states. "We were told the meeting with ministers would start at 8:30pm but they are not here. We are tired," an Ethiopian delegate protested as he walked away. The success of the next day's heads of state summit leaned much on the success of the previous day's deliberations by ministers and technical experts. And since the ministers and technocrats had disagreed on many things, it was clear the heads of state were headed for a deadlock too. The summit was partly organized to nudge Egypt, the biggest beneficiary of the Nile waters, to rejoin the Nile Basin Initiative (NBI), but the North African country set tough terms. In his April 26 letter to Water minister Sam Chepotoris, the Egyptian minister for irrigation and water resources, Mohammed Abdel-Atti, said his country would only rejoin if some provisions in the draft Cooperative Framework Agreement (CFA) were changed. "Egypt's proposal was to begin by resolving the two concerns that we feel enjoy the most common ground [namely consensus decision making and prior notification of Egypt before any project is done on the Nile]," read the letter read, a copy of which The Observer has obtained. "Egypt can then resume full participation in the NBI and return to the technical track." By the time El-Sisi met with Museveni and Desalegn, Egypt's terms had not been met and that limited the scope of discussions. In their meetings, the experts dwelled much on consensus and prior notification, with some clearly wondering "why a country with lesser population would want to decide for more than 200 million people?" According to a Tanzanian official who attended the closed-door meeting, it was resolved that the development of the Nile Basin states becomes a priority while ministers and experts continue deliberating on Egypt's terms. The official further revealed that El-Sisi said that his country was very reluctant to sign off agreements related to River Nile. El-Sisi reportedly said that his country was suffering from a water deficit of 21.5 billion cubic metres per year. In his speech, President Museveni dwelled on issues of the Nile Basin countries using the river and its conservation for development. Although Egypt hasn't yet rejoined NBI, it will engage in development projects in the region. "We have to work together to transform the Nile Basin countries into first world countries, to do away with backwardness and industrialise so that we have a modern society," he said. Museveni added that the incoming chairman from Burundi will continue to consult with all members. According to reliable information, Egypt suggested that the NBI states should replace the Entebbe Agreement (which negates Egypt's prior notification pre-condition) with a new document but most members were reluctant to accept. In a telephone interview with The Observer, Innocent Ntabana, the executive director of NBI, said on Friday that the newly-introduced document would be discussed by the extraordinary Nile Council of Ministers (Nile-COM). Ntabana explained that the heads of state met not to sign any pact but to discuss how to promote development using River Nile. The NBI executive director described the summit as a success because it illustrated that all countries are willing to engage through dialogue. "We were not expecting to have any agreement signed. It was important that we discuss development issues. This was the first heads of state meeting to discuss River Nile and that is a great step," said Ntabana. Meanwhile, the heads of state security teams had a battle of their own raging on the fringes of the summit. The UPDF Special Forces Command (SFC) officers clashed with their Egyptian counterparts after they learnt that the visitors had entered State House Entebbe, with six sniper guns. Security sources said SFC had asked all the security details of foreign leaders and other high-profile visitors to disarm on arrival so that they would centralize command and control of the security arrangements. The Egyptian security team, however, reportedly insisted on protecting their president. "We are here to guard our president just like you are here to guard yours. We cannot step aside for you," a source quoted an Egyptian security officer as telling his Ugandan counterparts. The Egyptians insisted on entering State House with guns, a move SFC rejected. As a result, the two groups engaged in a series of shoving bouts. "They fought for close to 30 minutes until an aide to the Egyptian president came out and ordered them to calm down," a State House staff said. One Egyptian security official reportedly left with a torn suit. On Friday, however, the SFC spokesperson, Maj Chris Magezi, denied that there had been a fight. "If they fought, did you see any causality at State House?" Magezi asked by telephone, and then hung up. This is not the first time SFC soldiers have fought with security officials of a visiting head of state. During the Muammar Gaddafi era, Libyan security officers usually fought publicly with SFC [then PGB] personnel.